Eggplant Parmesan with spaghetti is one of my all time favs and I first ate it at 'Olive Garden' and even today I eat the same entre when we go there!! I know the eggplants are deep fried in Olive Garden so I was looking for a baked option and uon googling, I found an eggless version of it and so here it is..
Make a paste of Maida and Milk and add more milk if necessary to get a bajji batter consistency. Cut the Eggplant into thick discs, dip them in the Maida-Milk batter and roll on bread crumbs or sprinkle bread crumbs on the discs. Arrange the eggplant discs on a greased baking tray and bake in a preheated oven at 400F for 25 min on one side. Flip them onto the other side and bake for another 10-15 min until they brown a little. 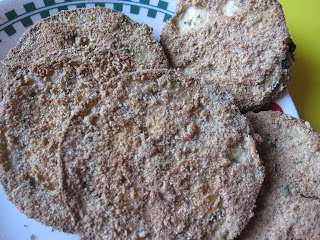 These baked Eggplant discs are good as a side dish for Dal/Sambar also.The baked eggplant discs look like this. 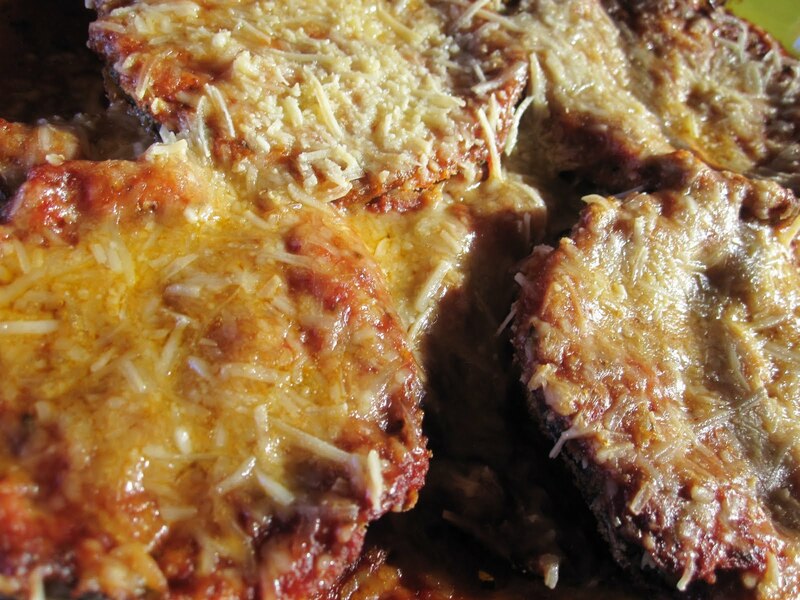 To make Eggplant Parmesan, In an oven safe dish, pour pizza/pasta sauce evenly and place the baked eggplant discs in a single layer. Add more sauce on the eggplant discs and sprinkle cheese as much as required. Bake at 400F for an additional 10-15 min until the cheese melts and browns a little. Serve with spaghetti or can be eaten as is. Such a droolworthy eggplant parmesan, looks soo cheesy and tempting..